Digestive disorders and gut inflammation are on the rise in our society today. With so many processed foods, environmental factors, and increased stress, it’s no wonder people have digestive issues. One of the biggest digestive diseases people deal with is GERD. Chances are you’ve heard of this disorder. Here’s some helpful information about this disease and that how you can reduce symptoms of this disorder and support healing of your digestive tract naturally. What exactly is GERD? Also known as gastroesophageal reflux disease, GERD is a digestive disorder that affects the area between your stomach and esophagus. Some people also refer to it as acid reflux. 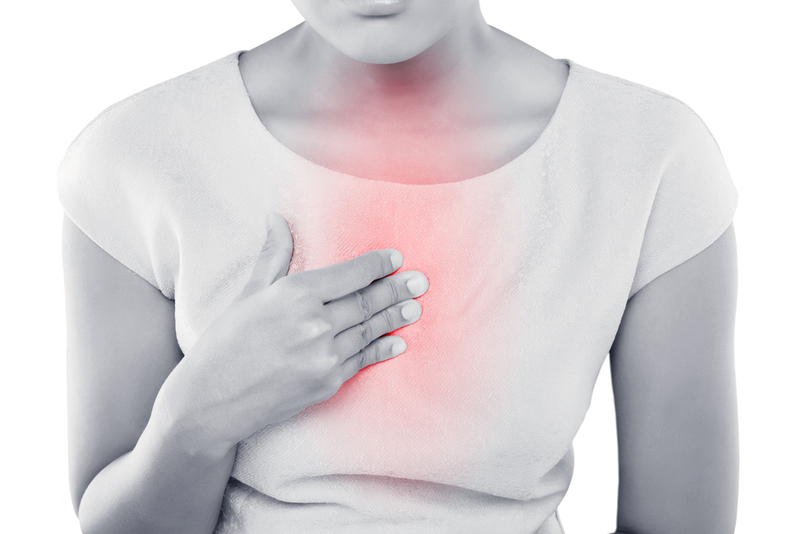 People who have this disorder experience intense and sometimes debilitating heartburn. When you eat, the acid in your stomach works to break down the food and prepare it for the digestion process. Sometimes the stomach acid works its way back up the esophagus and this causes irritation in the lining. Many people take over-the-counter antacids for these symptoms, but they don’t experience relief. Unfortunately, taking antacids over a long period actually lowers the normal acid level to a level that actually slows the normal digestive process and makes the symptoms worse. Additionally, this often results in nutritional deficiencies and slows the normal process of getting the nutrition from the food we eat. The first step in the digestive process is swallowing. As food travels down the esophagus to the stomach, the esophageal sphincter opens and closes. If the sphincter becomes weak, your stomach acid comes back up and releases a burning sensation. There are many reasons why someone may have to deal with this uncomfortable disease. Some reasons include obesity, hernia, pregnancy, and others. The important thing is to watch for the signs and see a doctor immediately if you think you’re dealing with gastroesophageal reflux disease. Natural Medicine Can Help Your Body Heal And Reduce Your Symptoms. If you think you’re dealing with these symptoms, don’t despair. Natural medicine is the best way to support the natural healing process, reduce your symptoms and promote recovery. There are certain foods to avoid and others that will gently restore your digestive system. These are common triggers for people who suffer from heartburn and other GERD symptoms. Remove gluten and processed foods from your diet and replace them with quality nutrients that enrich your body. Can’t I Just Deal With My Symptoms? While some people simply deal with their symptoms, it doesn’t have to be that way. In fact, those who don’t seek treatment can end up with a more dangerous issue. Your stomach acid will eat away at the lining which leaves scar tissue behind. Over time, you can develop ulcers in the lining. Natural medicine is a wonderful start to reduce the symptoms and start you on a new path to feeling better. If you need help recovering from GERD symptoms or other digestive disorder, the team at Gut Authority would love to help you. We believe that every patient deserves a unique plan that fits them. We’ll do the same for you. Contact us today!